Bangkok has everything. The food, the smells, the traffic, the skyscrapers, the bars, and the parks – you name it. We love our city because there is so much to do. If you like typical Thai culture, we obviously have that. Nowadays, there are areas for travellers and expats to enjoy some comforts of home. It’s difficult to not love Bangkok once you’ve seen and experienced what it has to offer. Sometimes though, we’ll all admit, Bangkok can become too much. As in any city, we just need a break from it all. The good thing about Bangkok is that it’s a hub. You can head out of the city in no time to get away. If you’re ever thinking about getting away from Bangkok, or just want to do a trip for a day, we’ve got some great options for you! Kanchanburi everyone seems to enjoy. Around 2 hours via mini bus (or 3 hours by 3rd class train) Kanchanaburi is a town bordered by Thai countryside. Erawan waterfalls are a must here, with all but 7 pristine waters to choose from within Erawan National Park. Death Railway and the River Kwai are also great to see. You wouldn’t of thought Bangkok would be so close to one of the most impressive national parks in the country would you? Khao Yai is awesome for hiking and any lovers of the outdoors. More famously, The Beach movie filmed a scene here. Remember when Richard jumps off the waterfall to reach the community at the island? Well that is called Haew Narok waterfall. You can visit, but its believed jumping off is prohibited. If you like temples, Ayutthaya will fill that void for you. Really, that’s all travellers and tourists do here, visit temples. With Ayutthaya once a Thai stronghold and the old capital, it is around 80km from Bangkok. If you’ve ever visited the Bagan temples in Myanmar, Ayutthaya is a small version of that! Although Ayutthaya is a city and has been vastly visited before Myanmar was open to tourists. Pattaya is around 1 hour away from Bangkok and known for its beaches. If its beach time you want, Pattaya is a nice place for that. Although once a fishing village half a century ago, Pattaya has many resorts, golf courses and catered to tourists. Rarely visited by travellers and backpackers, Koh Larn is the island alternative to the beaches in Pattaya. Koh Larn’s waters and beaches are nicer than Pattaya, and perfect for an island life day out. The place is a bit hit and miss, one day you’ll see it full of tourists (with a lot of Russians) and then next it’ll be empty. Try your luck! 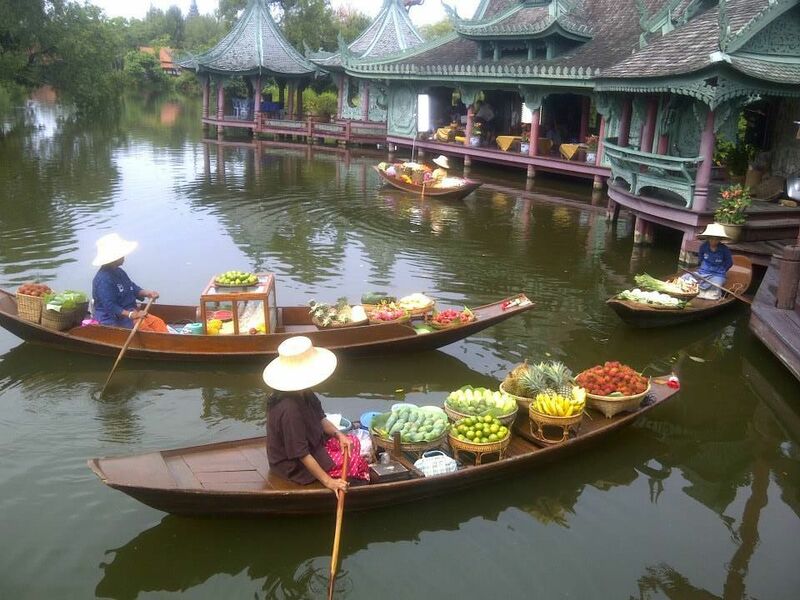 The popular choice for travellers, Damnoen Suduak is the spot to visit the floating markets for the first time. You’ll be out of the hustle and bustle of the city, and finding yourself floating down the network of canals window shopping, haggling and taking in your surroundings. A great choice that everyone who visits Bangkok must do!